Zach Mukwira paints one-off original artworks in oils using a technique he evolved from printmaking. 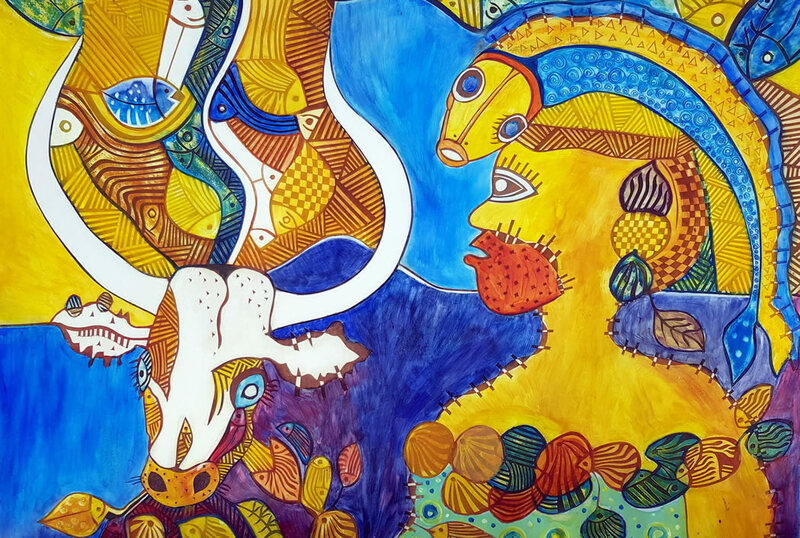 They are vibrant pieces with a contemporary African feel and have been exhibited in various galleries and exhibitions. The inspiration comes from the legendary folk stories that we heard sitting around a fire. I’m re-working them into visuals of the stories. They are semi abstract works using a technique that evolved from the art of printmaking, etching, but now I just do one-off pieces instead of making a plate and printing limited editions. I work in oils, because oils sit in well with this technique, where I cut into the top layer of double layered paper and peel out. Then I work the oil paint into the exposed places. What is the story behind the piece you’re currently working on? This piece is something that I thought of while I sat here this morning. It’s a person, a lady sitting down, I’m calling it face to face with reality. Sometimes stories are told by old people advising you not to go this way, and you put your fingers in your ears and choose not to listen. And then what you were advised not to do, or the route you took, now it comes, boom in your face. So you’re facing up to consequences. How did you get started with your art? I started a long time ago. My training was through an organisation called Zimbabwe Integration through Arts. 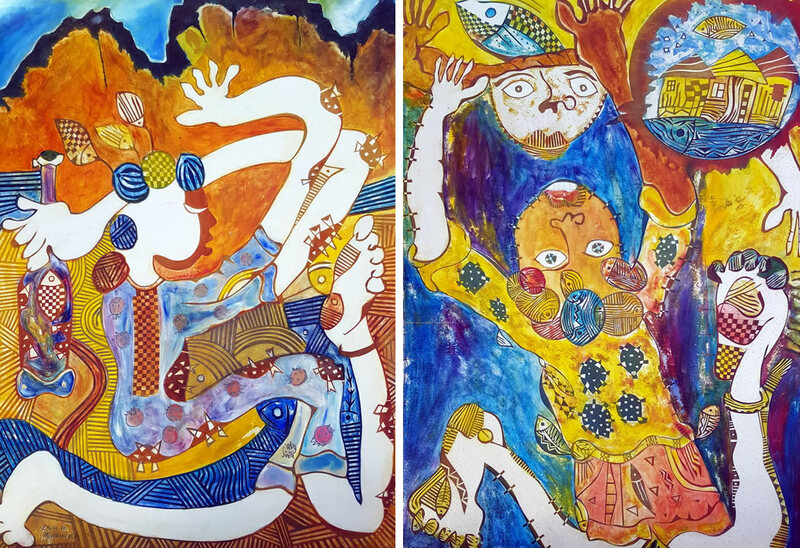 The motive was to help young disabled children to integrate into society through artwork. Oxfam UK trained us first to be able to manage children with disabilities, the language to use, and later art was introduced to us to use as a vehicle of integration. Before that at school I used to draw and write. I remember back in the 70s, when our headmaster had to send a notice or an invitation out to the parents, about 10 of us with the best hand-writing were chosen and we all went to a classroom where the invitation was written on the board and had to make five beautiful copies each. Printmaking came afterwards. I was active with the National Art Gallery of Zimbabwe and a lady from Canada taught us how to make plates to make prints. From that concept of print making, and what I’m seeing and what I’ve learnt myself, I bring them all together into one aspect, producing these art pieces now. Zach currently also has works at the Axis Art Gallery in Cape Town and will be exhibiting at Rondebosch Art in the Park on 6th April 2019. 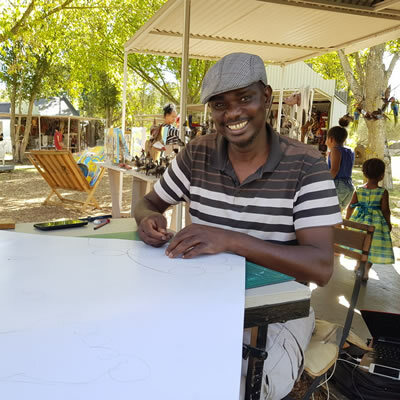 Visit the Craft Market at Spier to see more of Zach’s artworks and maybe catch him working on his next piece. Open every day until beginning May 10h00 to 17h30 on the lawns below the wine centre at Spier Wine Farm.